Contact dermatitis is an inflammatory skin disorder occurring normally after exposure to an irritant or allergen. 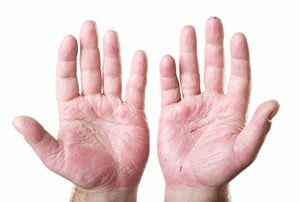 Contact dermatitis can appear similar to eczema. It may present from an appearance of hives to blisters on the skin that can be intensely itchy. 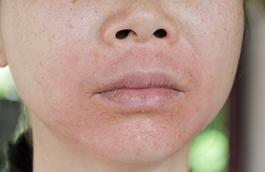 The rash is often limited to the region of the body exposed, but can however be diffuse and spread all over the body. Sites suggestive of contact dermatitis include: hands, eyelids and neck. Management involves a thorough history by our dermatologist and assessment of the skin rash. An assessment of occupational and recreational exposure will be undertaken by your Dermatologist. Potential investigations include Allergy Patch Testing to identify potential allergens. At Stafford we use the Australian standard series of allergens. This test for the 60 most common causes of allergic contact dermatitis. In some cases additional allergens will be used. Some allergy testing panels use far fewer allergens which reduces the sensitivity for detecting the cause of your dermatitis. The key to Management of Contact Dermatitis is to determine the relative contribution of irritant and allergic factors. Through avoidance of triggers / allergens and use of personal protection equipment at work contact dermatitis can often be managed. The general treatment of dermatitis with moisturisers and Topical (or oral) steroids can help resolve the rash in the short term. When an occupational trigger is involved this may involve liaising with your employer and Workcover regarding suitable duties and personal protective equipment requirements. Your Dermatologist will advise you about further investigations required and a management plan. Allergy Patch Tests are carried out to determine if the dermatitis or skin rashes could bedue to an allergy to a particular substance that your skin is contacting. The patch testing process involves applying a special adhesive tape to the back which contains diluted concentrations of a number of common allergens. Patch tests are not the same as skin prick allergy tests (SPT). The SPT is more useful for food allergy and dust mite allergy etc. Patch tests series using less allergens are often used elsewhere eg Standard European Series and True Test. The True test series for example has up to 36 allergens. These limited series will miss a significant number of potential allergens compared to the Australian series. Your dermatologist may also customise further allergy testing based on your history of exposure and occupation. The allergy patch tests are usually applied on Monday, removed on Wednesday and read on Thursday or Friday. The reason this patch test requires three visits is that it takes 96 hours for skin to react to a particular substance after that substance has been applied. Occasionally this reaction may occur within the first day, however a positive result is usually not seen until 48 hours. reference – Toholka R, Wang YS, Tate B, Tam M, Cahill J, Palmer A, Nixon R. The first Australian Baseline Series: Recommendations for patch testing in suspected contact dermatitis. Australas J Dermatol. 2015 May; 56 (2):107-15. doi: 10.1111/ajd.12186.